The Centre for International Studies and Diplomacy invites you to join fellow alumni, current students and CISD academics for food and refreshments at the The Harold NYC. Please note the event will take place on the 2nd Floor/ Mezzanine level. “As part of the Bring Back Our Girls 90-day global campaign, a high-level dialogue will be convened in New York to discuss national, regional and international responses to Boko Haram’s targeting of women and girls, with a view to further strengthening these responses. The event will bring together multiple stakeholders including the United Nations, it's Member States, regional organizations, women’s rights advocates and civil society organizations. High-level participants and speakers at the event will include representatives from the United Nations including the Deputy Secretary-General, Mrs. Amina Mohammed, and the Executive Director of UN Women and Under-Secretary-General Dr. Phumzile Mlambo-Ngcuka. Join us for an 'in conversation' to discuss: The Chibok Girls, Mass Kidnappings and Gender-Based Violence in the Lake Chad Region at the Africa Center in New York. We are delighted to be joined by Amina Mohammed, Deputy Secretary-General of the United Nations, who will be our keynote speaker. Join us on Sunday, March 17th at 12:00pm for a 1-hour curated tour of an exhibition at the Computer History Museum entitled 'Where To? A History of Autonomous Vehicles". Our curator will be Dr. John Mashey, Board Member of the CHM, who worked on the Unix operating system at Bell Labs, and was previously Chief Scientist at Silicon Graphics. Following our tour of the museum, we will head to nearby Indian restaurant Zareen's across the road from the CHM for a delicious lunch. Come get to know some of your fellow SOAS alumni at a mixer on Thursday, March 7th @ 6:00pm at Local 16 Restaurant (1602 U St NW, Washington, DC 20009). For any questions and to RSVP, please contact Whitney (DC Alumni Ambassador) at whitney.purdum@gmail.com or send us an email at afsoas1@gmail.com. Thanks and see you there! AFSOAS Alumni & Friends Trip: GHANA! Please join us for our first-ever American Friends of SOAS "Alumni & Friends" trip -- we are heading to GHANA! During this trip we will spend several days with Dr. Felix Ameka, a Ghanaian academic and collaborator with SOAS's Endangered Language Documentation Programme (ELDP) learning about the work to document critically endangered languages in Ghana and doing site visits with some of these communities (including Animere -& Adele-speaking communities). We will also enjoy a lecture at the University of Ghana - Legon, an exchange with the local alumni association in Ghana, and a full schedule of sightseeing, learning and cultural engagement as we travel through Accra, Ho, Nkwanta, Kumasi and Cape Coast! Though this trip is intended for American alumni of SOAS and their family & friends, anyone with an interest in learning and travel is most welcome to apply. Space is limited to 20 persons though, so it is advisable to apply early. Double room / shared accommodation for 10 nights at mid-range hotels. *A single room supplement is also available for an additional $500. Essential tips for hotel and restaurant staff, drivers, guides, etc. Any additional tips for any hotel or restaurant staff, drivers, guides, etc. Please use the following links to download the application materials. When complete, please send your application materials and nonrefundable deposit of $500 (preferably a check made out to “American Friends of SOAS”) to: American Friends of SOAS, PO Box 2744, Orange, CA 92859. You may also email a copy of your application materials to afsoas1@gmail.com to further expedite the process of securing your spot, but we still require that you mail us the physical completed application materials with your original signature. For any questions, please contact us at afsoas1@gmail.com. Come get to know some of your fellow SOAS alumni at a mixer on Friday, January 11th @ 6:00pm at Local 16 Restaurant (1602 U St NW, Washington, DC 20009). We are thrilled to invite all of our California-based alumni to an "At Home" festive season party hosted by the AFSOAS Vice-President, Dr Bharti Kansara in Cupertino, CA on Sunday December 9th 2018 from 12-3pm. A lunch of Indo-Persian cuisine and mulled wine will be provided. Both Jessica Adomako and guest Saprina Panday, an International multimedia storyteller passionate about feminism and intersectionality, will be giving talks. This will be an opportunity to gather with other local SOAS alumni and hear more about the winter alumni tour of Ghana planned for January 27th 2019. Alumni will be travelling through Ghana with Dr Felix Ameka, Professor at the University of Leiden and the purpose of the trip is to learn about the work to document critically endangered languages in Ghana and site visits with some of these communities (including Animere -& Adele-speaking communities). We will also enjoy a lecture at the University of Ghana - Legon, an exchange with the local alumni association in Ghana, and a full schedule of sightseeing, learning and cultural engagement as they travel through Accra, Ho, Nkwanta, Kumasi and Cape Coast. Whilst this trip is intended for American alumni of SOAS and their family & friends, anyone with an interest in learning and travel is most welcome to apply. Space is limited to 20 persons though, so it is advisable to apply early. From this trip, it is our goal to provide 2 prospective Ghanaian students with scholarships to undertake a 2-week intensive course on the Endangered Language Documentation Programme ELDP at SOAS next fall. Please register for this event direct at AFSOAS1@gmail.com and you'll then be given contact details and the address of the event in Cupertino. We hope to see you there! Come get to know some of your fellow SOAS alumni at a mixer on Thursday, November 1st @ 6:00pm at Local 16 Restaurant (1602 U St NW, Washington, DC 20009), and learn more about our upcoming (first-ever!) 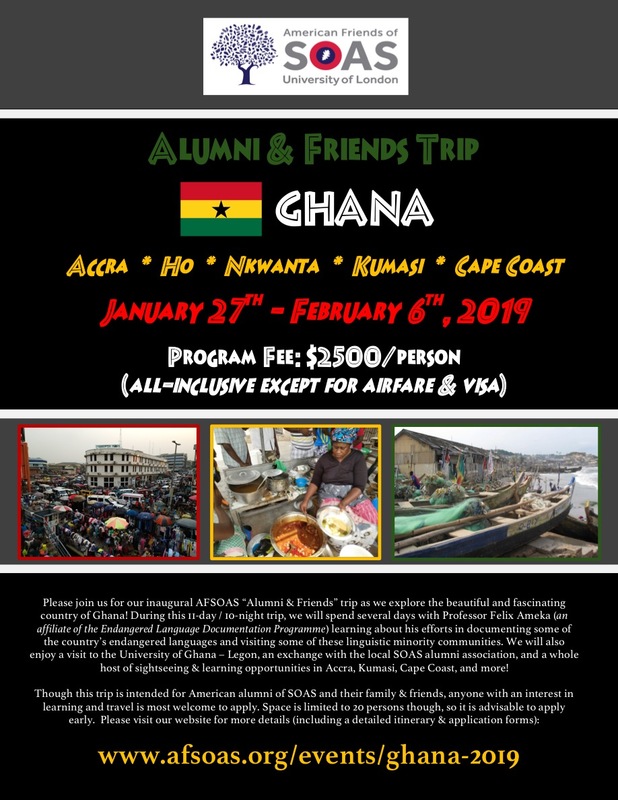 “AFSOAS Alumni & Friends Trip” to GHANA this January 27th - February 6th, 2019! Alumni & Prospective Students - join us for a meet & greet with visiting SOAS Professor and Director of the South Asia Institute, Prof. Edward Simpson, at the Harlem Tavern (near Columbia University) on Tuesday, October 16th @ 7:30pm! As space is limited with our current reservation, please RSVP to Brent at brentwsiegel@gmail.com or to afsoas1@gmail.com to secure a seat. Join us for a fun and insightful evening at Harper's Garden on Wednesday, September 26th from 6-9pm. In addition to a short talk by a guest speaker, we will be sharing all the details of our upcoming alumni trip to GHANA scheduled for January 27th - February 6th, 2019, as well as our plans to establish a strong SOAS alumni network in Philadelphia. If you are interested in getting involved or learning more, we strongly encourage you to attend. Suggested minimum donation of $20. All donations will support our efforts to bring 2 scholars from Ghana to receive training at the Endangered Languages Documentation Programme at SOAS in Fall 2019, in an effort to help them document and preserve their respective communities' languages. Join us for a fun and insightful evening at the beautiful Kapoor Galleries. Drinks and refreshments will be served, and we will be sharing all the details of our upcoming alumni trip to GHANA scheduled for January 27th - February 6th, 2019! Since 1975, Kapoor Galleries Inc. has played an instrumental role in educating the public about Ancient and Classical Fine Arts of India and the Himalayas and encouraging interest in Indian art among collectors and institutions. Kapoor Galleries Inc. is consistently the privileged custodian of top-quality bronzes, sculptures, miniatures, and thangkas, many of which are now part of the collections of major museums, including The Metropolitan Museum of Art, the Los Angeles County Museum of Art, the Art Institute of Chicago, The San Diego Museum of Art, and the Virginia Museum of Fine Arts. All SOAS American alumni & students are invited to join us for drinks at the Marquis Cornwallis (near campus at the Brunswick Centre) to learn more about AFSOAS, get to know our current President (Greg Buie) and Vice President (Bharti Kansara), and hear details of our first-ever AFSOAS alumni trip to Ghana scheduled for January 2019! One of AFSOAS's priorities this year is to forge stronger relations with students & alumni from across Africa, so that we can learn from & support each other and create bonds between SOAS alumni here in North America with our counterparts in countries throughout Africa. We are thrilled to announce we will be hosting an alumni gathering in Addis Ababa on the evening of Wednesday, August 8th at The Vault Lounge. Please join us for a drink, networking, and conversation with fellow alumni & friends. We will also be sharing plans for our upcoming alumni trip to Ghana in early 2019. In her new book, "Silk, Slaves and Stupas: Material Culture of the Silk Road," scholar and traveler Susan Whitfield (a SOAS alumna) tells the stories of 10 very different objects. She considers their interactions with the peoples and cultures of the Silk Road—those who made, carried, received, sold, worshipped, and, in more recent times, bought, conserved, collected, and exhibited them—thereby revealing the cultural diversity and interaction along these trading routes of Afro-Eurasia. UCLA distinguished professor Peter Sellars joins Whitfield in conversation. Calling all Centre for International Studies and Diplomacy (CISD) alumni -- please join visiting SOAS staff and fellow CISD alumni for a mini-lecture by Dr. Ashley Cox (Convenor - History and Future of the United Nations), followed by a reception at the beautiful W Hotel overlooking the White House. Calling all Centre for International Studies and Diplomacy (CISD) alumni -- please join visiting SOAS staff and fellow CISD alumni for drinks and networking. We are delighted to invite you to a special dinner with SOAS' Dr Ashley Cox (Centre of International Studies and Diplomacy). The evening will be a chance to hear about his work and research, and hopefully prompt a stimulating debate over good food, and with great company. Ashley Cox has completed his PhD at the University of Leicester examining the Wilson motivations for American Conflicts. Having completed an MA in International Security and a Bachelors degree in Contemporary History and a Fulbright Sponsored course In American Studies at New York University. Please join AFSOAS President Greg Buie (M.A. International Studies & Diplomacy - 2007) & Vice President Dr. Bharti Kansari (PhD, South Asian Studies - 1975)for a memorable evening of learning and exchange. We are delighted to have Dr. Tom Grunfeld (M.A. Far East Area Studies - 1973) with us to share his insights on recent current events in China & North Korea. We will also be sharing some exciting new updates about AFSOAS, including plans for our first-ever "Alumni & Friends Trip," for which we will be heading to...GHANA! Wine & appetizers will be served. Tax-deductible donations in any amount for the John Loiello Scholarship and the Endangered Languages Documentation Programme (with a focus on Ghana this year) will be gladly accepted. Our AFSOAS Vice President Bharti Kansara (PhD, South Asian Studies - 1975) and Secretary Jessica Adomako (Study Abroad - 2012) invite you to join us for a special get-together at the beautiful University Club in San Francisco on March 1st, 2018. Our new AFSOAS President Mr. Greg Buie (MA, International Studies and Diplomacy - 2007) will be on-hand to share his insights about the future of AFSOAS and how you - our fellow alumni & friends - can stay connected to the university, fellow students & alumni, and lifelong learning opportunities. 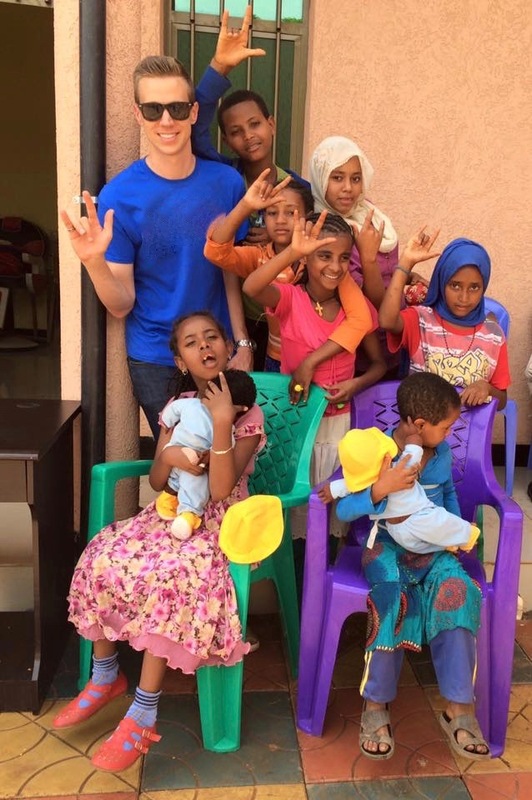 Greg will also be speaking about his experiences running a nonprofit organization in Ethiopia, where his organization Visions Global Empowerment seeks specifically to help promote the development of Deaf civil society. We are also delighted to have Dr. Federico Olivieri (MA, Global Media and Postnational Communication - 2009) with us to share about his experience in organizing the Slum Film Festival in Nairobi, Kenya. A Q&A session will follow these presentations, along with time for socializing & networking. We hope you can join us! Greek and Indian civilizations interacted through Indus Valley trade, Alexander’s conquests and the spread of Hellenism to India with its concept of the cosmopolis. This talk will depict, through analysing dramatic verse, mantra and bardic singing, and visual representation, the forces shaping the struggles of Indian epic heroes Sahastra Arjuna, Parshurama and Alarka of the classic compendium, the Dutta Mahatmya, compared with the forces shaping the great Homeric heroes Hector, Achilles and Odysseus. These forces include the role of destiny (daiva), karma and individual suffering and responsibility, showing the interplay between spiritual and humanistic thinking in shaping the hero’s moral consciousness, and how male and female energies contribute to cathartic resolution as seen in the story of Renuka. Dr. Kansara is Author and Educator at FlashpointInteract.com, which seeks to empower High School students in the study of the Humanities, so they can rise to their full potential through the use of interactive content and methods. Her past experience includes being an editor in academic publishing at the Open University in England, one of the first educational institutions to pioneer long-distance teaching through interactive media; member of the BBC’s General Advisory Council; co-director of the Academy of Indian Dance, sponsored by the Greater London Council. Dr. Kansara is also Vice President of American Friends of SOAS (SOAS, University of London). She also writes a blog at www.theyoganature.com. She holds a BA (Cantab) and PhD (SOAS, University of London). For more information you can contact 415.668.1559 or email culturalfellowship@sbcglobal.net. You can also visit www.culturalintegrationfellowship.org.